Descubra los famosos canales de Alappuzha durante esta excursión de siete horas desde Fort Kochi. Disfrute de la belleza y la tranquilidad de uno de los destinos más aclamados de Kerala mientras navega por la red de canales a bordo de una casa tradicional. Disfrute de cerca la vida rural y la impresionante naturaleza durante este día memorable en el agua. Escápate de la ciudad y relájate y descansa en la naturaleza. Aprende sobre la vida local y prueba la cocina de Kerala. We had a beautiful day. The houseboat was extremely comfortable and the lunch was great. The staff really worked hard to make sure that our experience was a super one. I would highly recommend this tour. One of the best experiences we had! We must do an overnight trip to really enjoy the boat ride and food!! Excellent boat tour of the Kerala Backwaters of Alleppey. You get a great chef on board that makes amazing south indian seafood. The tour is so peaceful and scenic you have to see it to believe it. All the staff that host you are great. You're getting the whole boat to yourself for the day tour! My friend and I booked this tour in advance of our arrival. The drive down to Alleppy was easy and then we had our OWN houseboat for the two of us. The drive was lovely, the staff was great, the food was DELICIOUS, and the length of time was really good I think. A well-spent afternoon. We could not have had a better time than on our private Kochi Tour. The Houseboat was beautiful and so comfortable. 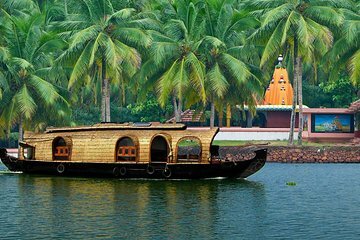 Two couples enjoyed the day lounging, dining and enjoying the scenery in Kerala. Our fellow passengers on our cruise, passed us as they sat on hard plastic chairs in a large tour boat without food. We were enjoying our lovely meal prepared by 3 great chefs. The cruise passengers were very jealous and paid much more than we. I can't say enough about the trip.